Modern amenities like HD TV, air-conditioning, etc. 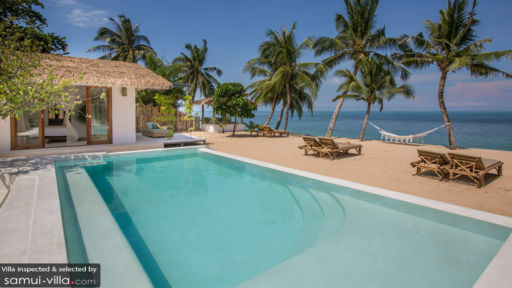 Kya Beach House is a quintessential tropical holiday property located on purely beach land with white sandy shores at Bang Por beach parallel to its beach gardens. The villa features design that rivals the ocean in all its glory with cyan hues, trussed wooden ceilings, open-concept living areas, and poolside traditional salas. 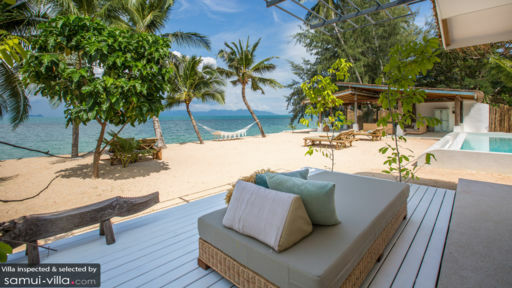 The villa comprises three luxe bedrooms that are part of a mission to incorporate all elements of Koh Samui’s resplendent island life within and without its walls. Wake up to the sun rise with a mindful yoga session and let the tropical breeze lull you to a sound sleep. Three stunning bedrooms with adjoining terrace stand around the beach frontage offering spectacular views of the ocean as well as two bedrooms with direct access to the pool area. Whitewashed serenity swathed in tropical goodness, the bedrooms encompass tropical modernity at its finest. There are indoor plants to freshen up the space even further. The four-poster king-sized beds have mosquito nets to keep the biters at bay. There is a unique garden bedroom with a private deck perfect for stargazing and relishing the fresh tropical breeze. The second bedroom is a poolside bungalow while the third bedroom is located upstairs with a high-soaring ceiling. Each bedroom is one of a kind with distinct interiors, ravishing colour schemes channelling their tropical home, and plenty of modern amenities. Ensuite bathrooms accompany the bedrooms with an open-air design, lush greenery, and showers. A panorama that spans across 32-metres of beach frontage, turquoise ocean water, and clear skies frames the stunning outdoors at Kya Beach House. Staying true to its name, the beach house is built on beach land itself with palm trees leaning towards the ocean as if paying homage to its wondrous presence. A hammock right beside the ocean is perfect for lazy afternoons. The saltwater swimming pool runs for 8 metres in length with a shallow end for kids. The sun deck doubles as the beach with recliners to lounge on and for sunbathing while enjoying the view. There is a poolside sala with luxe seating that can also be used as the yoga pavilion. A BBQ can be set up as per your request. While being tropically diverse and essentially a beach house, Kya Beach House prides itself in offering modern, top of the line amenities such as an entertainment system with 55”-HD Smart TV, surround sound speakers, and air-conditioning. The living area is both indoor and outdoor to suit your needs. 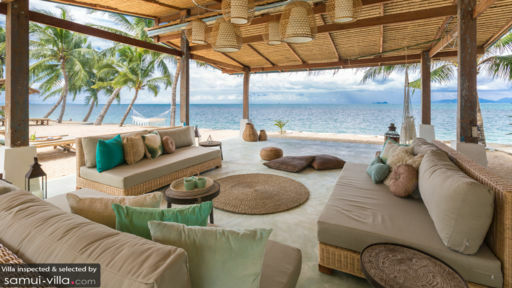 The rattan sofas are upholstered with cyan-hued fabric to compliment the beautiful ocean hues. The simple décor lends itself to the opulence of the room with low-floor seating, woven jute rugs, thatched-ceilings, and wicker chairs. Another romantic feature of the villa is beachside dining with a bamboo dining area featuring specially-made hand-crafted bamboo chairs that stands on the beach land overlooking the stunning ocean. Indoors, you have the fully-equipped, modern kitchen with state of the art appliances and fittings. With a raised bar-style table and accompanying stools, you have another indoor dining area to yourself. There are two members of staff on-property full-time so you can rest assured that you are well taken care of. With a villa manager, guests are free to access special services such as massages in-house, transportation, Thai cooking classes, and Muay Thai to name a few. These will be charged additionally. Prepare to be wowed by the house chef’s skills at making scrumptious feasts for guests. The villa itself is a beach house so you have unobstructed access to pristine white-sand beach frontage. Take out a kayak and paddleboard by requesting the staff or go snorkelling to check out the marine life in this part of the world. Within walkable distance from the beach house are plenty restaurants, bars, and cafes.